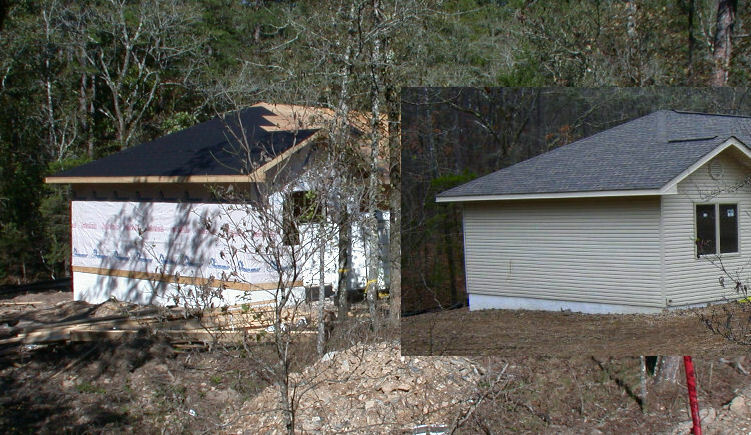 In Houston, we always had slab foundations, but in HSV, most houses are built on the sides of hills, so they have pier-and-truss (or pier-and-beam) foundations. I would guess that fewer than 10% of houses in HSV are built on slabs. We thought that Judy's lot was flat enough (2' drop, front-to-back) to put a slab on, but we were measuring from front-to-back on one side. The drop from right-front to back-left was 3 times as much, so we ended up with pier-and-beam. It is hard to find any advantage of slabs over pier-and-beam, other than a slab being cheaper and easier to build on a flat lot. It also may be necessary if ground water is a problem, which is rarely the case in HSV. Thermal conduction through the concrete can be a problem with slabs, although it is possible to insulate slabs. With even a modest amount of crawl space, it is still easier to work on pipes than if they are buried in/under a concrete slab. 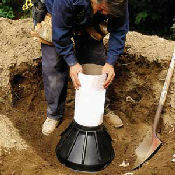 However, one source refers to a crawl space as being a "slight" money-saving option compared to a full-height basement. Because placement of our garage was a problem (blocking views) and we ended up with a detached garage, I have often wondered if we would have been better off excavating and putting the garage under the house. It could have stuck out enough where our deck is to have it's roof serve as the deck. With enough slope on the lot, there can be room under the house for the water heater and HVAC system. With even more slope, you can put additional rooms under the main floor for relatively little additional cost. Guest bedrooms, family rooms, game rooms, and work shops are commonly added in this bonus space. We elected to have a sheetrocked, but unheated, room (10'x17') added at the bottom of one corner of the house that was sloped enough to allow it. We use this for storage, but it could also be used as a workshop, etc. 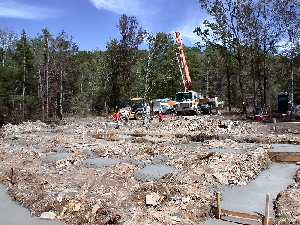 After the surveyor has laid out the boundaries of the lot and the construction area has been cleared of trees and brush and leveled, the next step is to pour the concrete footers. These are holes and trenches which are dug and filled with concrete to provide support for the slab or piers and foundation walls. Before digging the holes and trenches, the floor plan is laid out on the ground with paint or chalk so that the workers know where to dig. If a plan is very basic, such as just a rectangle, this step may not be needed. 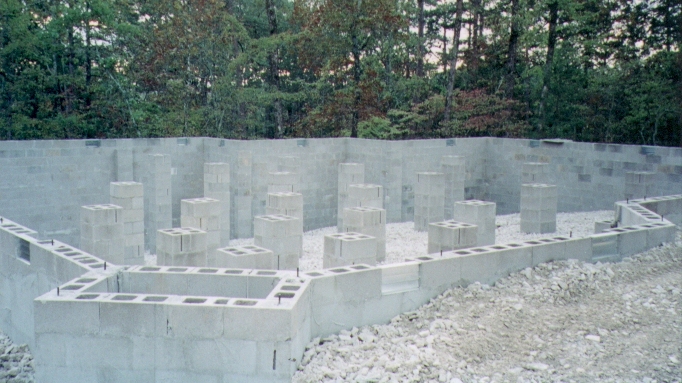 After the footings have cured, which takes 3-7 days, foundation walls of cement blocks are normally erected. ThisOldHouse also recommends pouring concrete foundation walls instead of using cement blocks. If your garage is on a slope, the choices are to put up the foundation walls for the garage and fill them in with dirt and pour the slab on top of that, or put in a suspended slab. The former method is probably cheaper and easier, and that is what was done at our house. At Judy's house, her back patio is 4' off the ground, and we also used a slab on cinder-block foundation filled in with dirt. The fill-in dirt must be thoroughly compacted; otherwise, it will settle over time and your slab will settle with it. On mountain-view lots built on extreme slopes, the builder may have no choice but to use a suspended slab. Either way, if you work on your car a lot, you might want to have the builder leave a hole in the floor where you can stand up under the car to work on it. Piers go up next. Our den is 18'x20' and we were putting a heavy pool table in the middle, so we got the builder to put additional piers in that area to provide additional support. We did not get extra support for an equally heavy dining room table because it was going to be closer to a wall in a narrower room, and thus would get sufficient support from the regular piers. We put a drain at the lowest point under the house so that any water that might get under the house would have a way out. We were concerned that otherwise, if any water got under the house, such as from a leak (or worse) in a pipe or the water heater, the cement block walls would hold it in indefinitely. The drain pipe was cheap enough to do and now we don't have to worry about flooding. Judy's builder put a drain pipe around her foundation and painted the foundation (cement block) walls with waterproof paint to keep ground water from getting inside after dirt was filled in outside the foundation walls. Vinyl enamel, which is often used on swimming pools, is excellent for that purpose. The ground under the house is covered with a 6 mil vapor barrier. Most builders use polyethylene sheeting, but the inexpensive variety is made with low-density polyethlene resins. It may have pinholes in the material and may degrade or break down in contact with alkaline soils. High-performance polyethelene vapor barrier is made using virgin (as opposed to recycled) high-density polyethylene with two or more sheets cross-laminated at 90-degrees and fused with a hot-melt resin. While this material is more expensive, the total cost is minimal anyway and it is often 50 times better at resisting water vapor transmission. However, it will do no good to pay for the higher quality polyethelene if it is not installed properly. Vapor barrier must be sealed to the foundation walls to prevent vapor from coming around the edges, and we doubt that many builders do this. Likewise, overlapping borders between sheets must be sealed. An inadequate vapor barrier may lead to a dangerous and expensive-to-fix mold problem. Batt insulation is put between the trusses. 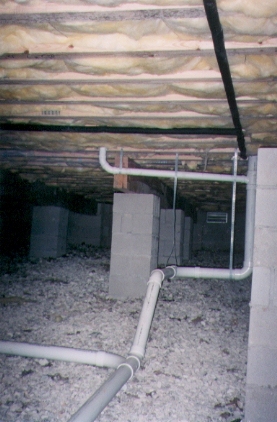 As you can see in the picture, the advantage of crawl space instead of a slab is that you can easily (depending on the slope of the lot) work on plumbing and electrical lines. When the subflooring was put down, we were able to walk across the floor and for the first time see what views we would have from all parts of the house. 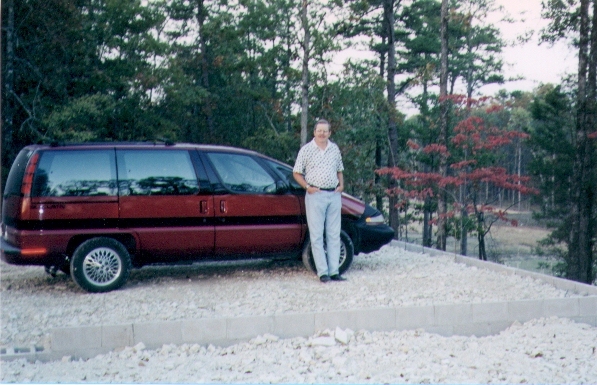 Since the lot slopes, the floor is as much as 10'-20' off the ground. Unless you climb a tree, you can't see the views your house will have until the subflooring is in place. 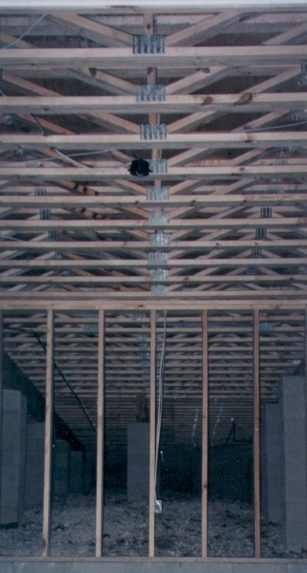 At Judy's house, the builder (Jim Buss) not only conscientiously screwed down all the subflooring, but also used an adhesive between the subfloor and trusses. Judy should not be hearing any squeaks in that house. In contrast, while Judy's house was being built, I went into another house in our neighborhood which was nearing the end of construction and had a lot of high-end features, but the flooring was not in yet and I could see that the subflooring was just nailed down. This probably means that the sheetrock was only nailed as well. So that house will have lovely wooden floors, but laid on top of squeaking subflooring, and walls with elaborate wood trim, but nails which will be popping up from the sheetrock. 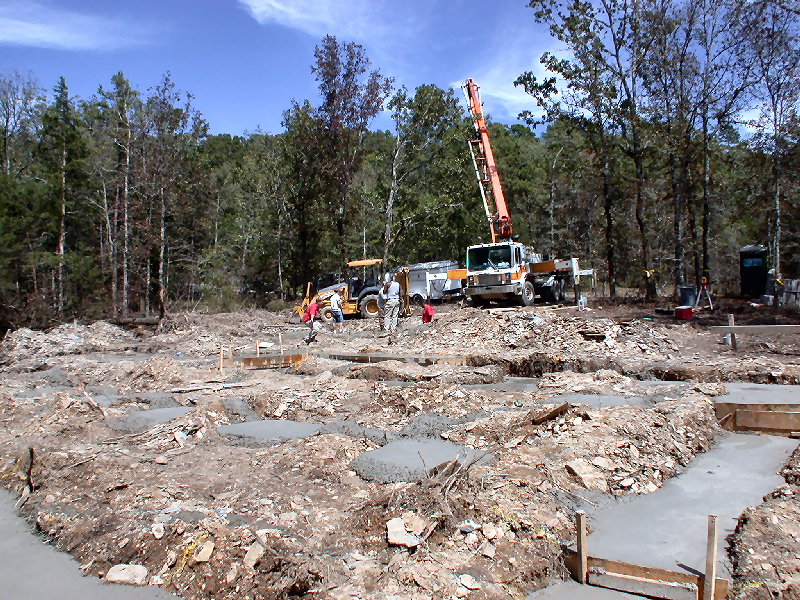 If any dirt is added to the foundation area ("backfilled"), it must be compacted. The foundation area is covered with 4"-6" of gravel, compacted. The gravel is covered with a 6-mil plastic vapor barrier which is then covered with a 2" layer of sand. 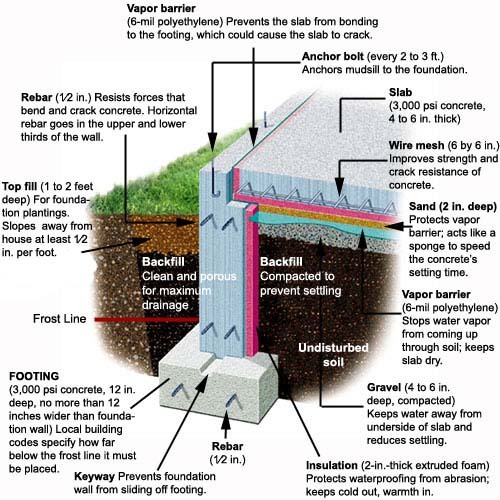 Note that with a pier-and-beam foundation, the gravel goes on top of the vapor barrier to hold it in place and protect the plastic from being torn when walked on, but with a slab foundation, the plastic goes on top of the gravel. The illustration above is from ThisOldHouse.com -- click here for more information. Once the slab has hardened, framing of the walls and roof can begin. A popular option these days is to stain/dye and polish or stamp a pattern on the concrete foundation to use as the finished flooring. You never want to see big cracks in your concrete slab, but even less so if you are going to have exposed concrete as your finished flooring. Even with a pier-and-beam foundation, you do not want the concrete weakened to half of its nominal strength or less. As noted on the page for pouring a concrete driveway, many factors can affect the quality and strength of the concrete. One of the main factors is the temperature when the concrete is poured. While it is possible to pour concrete in freezing temperature if additional steps are taken to protect it from freezing, as described at the link above, this is definitely something you should discuss with the builder to make sure those steps WILL be taken. A better alternative would be to wait until around April to begin construction. This gives the builder 7 months or so to get to the point where the driveway and sidewalk(s) should be poured and cured before the first November freeze hits. 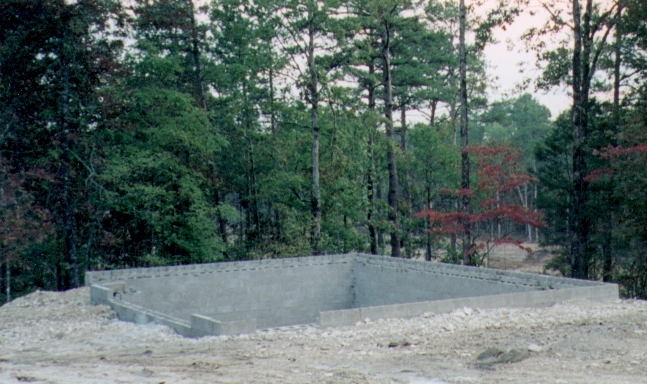 On the other end of the calendar -- if you are planning to start building in the Fall, do all you can to get the foundation poured by the first part of November. Don't forget that after you sign a contract with a builder, it will be 2-3 weeks (or longer) before he can get ready to submit applications to the building committee (which only meets twice a month) and get approval for construction. figure on signing that contract no later than the first of October.